Detail of photo of Guy and Edna Ballard taken at the Chicago Civic Opera House where they were holding classes. Caption on the photo of Guy Ballard, Edna Ballard, Donald Ballard and his wife Marjorie: 'THE GREAT I AM' movement's leaders - 'accredited messengers' of the new faith born of visions - smile for the camera. 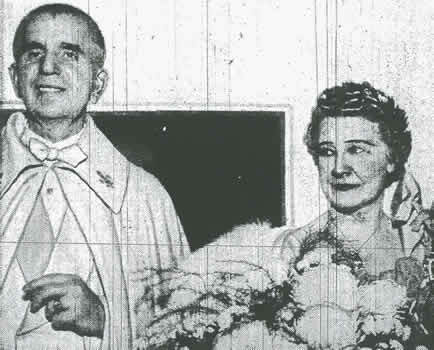 Left to right are Mr. and Mrs. G. W. Ballard, their son, Donald, and his wife, as they appeared yesterday at the Civic Opera House, where thousands have heard their lecture. In this article, Guy Ballard (Godfre) and Edna Ballard (Lotus) spoke with the newspaper reporter about their experiences detailed in UNVEILED MYSTERIES and THE MAGIC PRESENCE. As tall, gray-haired G. W, Ballard prepared for another meeting of his "I AM" movement at the Civic Opera House yesterday, he told about the origin and development of his work and the events which led to his teachings. "But they weren't miracles as most people understand them," he said. "They were real things which actually happened to me, to Mrs. Ballard and my son." "We saw and talked to the 'Ascended Masters' in their great retreat in the Rocky Mountains. I visited civilization centuries ago and saw my embodiment and what I did in those times. "So real were these visits, that at times I even paid railroad and steamship fare. I can't tell you when or where this occurred because the 'Ascended Masters' have directed me not to." The Ballards' meetings at the Civic Opera House began Friday. Afternoon and evening sessions are held and at least 5,000 persons attended each day. Many wear evening dress at the night "classes". The movement is national in scope and claims some 700,000 adherents. Through their devotion to teaching the world about "The Great I Am Presence", the Ballards have no need to worry about the physical comforts of life. Mrs. Ballard is expensively bejeweled and gowned; so is Mrs. Donald Ballard, their daughter-in-law. The father and son - all three are designated "Accredited Messengers of the Faith" - wore immaculate white clothes. Transportation between their downtown hotel and the Civic Opera Building is in two automobiles of finest make. One is painted a golden color. The other is a light blue, described as "electric blue". The colors are significant of their faith as dictated to them by Saint Germain, the "Ascended Master" who appeared to them in material form and, they say, directs their activities. Gold is symbolic of wisdom, and electric blue denotes power. The third color, a rose pink, signifies love. The Ballards make no secret of the fact that their cup of material happiness is full to overflowing. You too, can enjoy the same benefits, they say if you follow their teachings and are able to receive the "Great Cosmic Light" from the "Mighty I Am Presence". "We didn't know where our next meal was coming from when we started our work in 1932. We had faith and our faith was justified. Things just worked out right for us. They can for anyone." He was a mining engineer, managing an uncle's mines in Arizona in 1929. She was a concert harpist. Both were deeply spiritual. "We had studied metaphysics, spiritualism, the occult sciences and theosophy", Mr. Ballard said, "but we hadn't found the answer to the law of life." Mrs. Ballard said she had found that when she held her hands near people who were ill, and concentrated upon healing them, many were made well, but she didn't know why until her husband's experience on Mount Shasta in California. He went there on a hike one day and a young man appeared suddenly beside him and gave him a cup of milk-like liquid to drink. "The taste was delicious and the electric vivifying effect on my mind and body made me gasp with surprise", he said. The young man introduced himself as Saint Germain and, thereafter, in August, September and October of 1930, Mr. Ballard experienced a series of happenings which, he asserts, were Saint Germain's way of convincing him and teaching him of the truth of the I Am Presence and its meaning. "Saint Germain withdrew me from my body," he said, "and lifted me from the ground. I could see my physical body resting where I had been lying. Saint Germain began to show me some of the previous lives I had lived." First, he was introduced to a village in France where he was born as the daughter of a beautiful mother. He saw himself become a famous woman opera singer. Saint Germain next showed him an embodiment in Egypt. 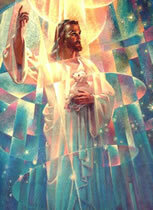 Mrs. Ballard said they went to a long-lost city and there he recognized his son, Donald, as the high priest in a temple. He himself was the assisting priest and his wife, Lotus, was the vestal virgin guarding the sacred fire. He awoke in his earthly body after these experiences, Mr. Ballard says. 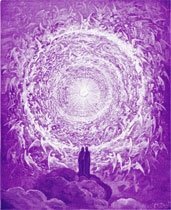 Then there was another meeting with Saint Germain at which, without leaving the body, they used "projected consciousness" to see events which happened in the Sahara Desert 70,000 years ago. "The desert was then a garden and civilization was much more advanced than ours," he said. "For instance," said Mr. Ballard, "they had airplanes which made ours look insignificant and they derived their power from the atmosphere. "The people were near perfection, but they sinned, succumbed to hate and greed, and were reduced to the status of ordinary mortals." These happenings were climaxed by a visit in another body, the head of the I Am movement relates, to the Royal Teton Mountain. Saint Germain showed him a door which only an ascended being could enter. They entered an elevator made of glistening metal and descended 2,000 feet into the mountain. Below was a great audience chamber where the perfected beings gathered. Miraculous screens projected, as in a moving picture, scenes from all over the world and on the other planets in times past and present. "There also," he said, "we found the absolute, physical histories of civilizations for four and one-half million years. I could read them. They were tangible. I could hold them. "Later I met Mrs. Ballard and Donald at the retreat and we were shown many other things. Wealth in gold, precious stones and metals of the lost continents of Mu and Atlantis is stored there awaiting the time when the perfected beings will release it for the use of mankind." There were other adventures, including a visit to the civilization of the ancient Incas, where the Ballards were brothers and sisters and were even then, 14,000 years ago, under the influence of the Great I Am Presence. "After these and other experiences," Mr. Ballard said, "we started out teaching in Chicago. At first we had seven students, then fourteen, then twenty-one. We met in a room in the Pure Oil Building. "Recently, Saint Germain told me that we have more than 600,000. Two years ago he told me we had 300,000." The Ballards' meetings will continue through October 16.